Sometimes, I have an idea that drives my resource creation. Then, I start searching for clip art that coordinates with my idea. And other times, I discover clip art that inspires my resource creation. That was the case when I came across these adorable turkeys holding high-frequency words (by Jen Hart Design)! As soon as I saw these word turkeys, I knew I needed to create a resource centered around them. To start, I designed a game for practicing recognition of high-frequency words. Then, I decided those turkey word cards were also perfect for a spell, read, build, and write activity. 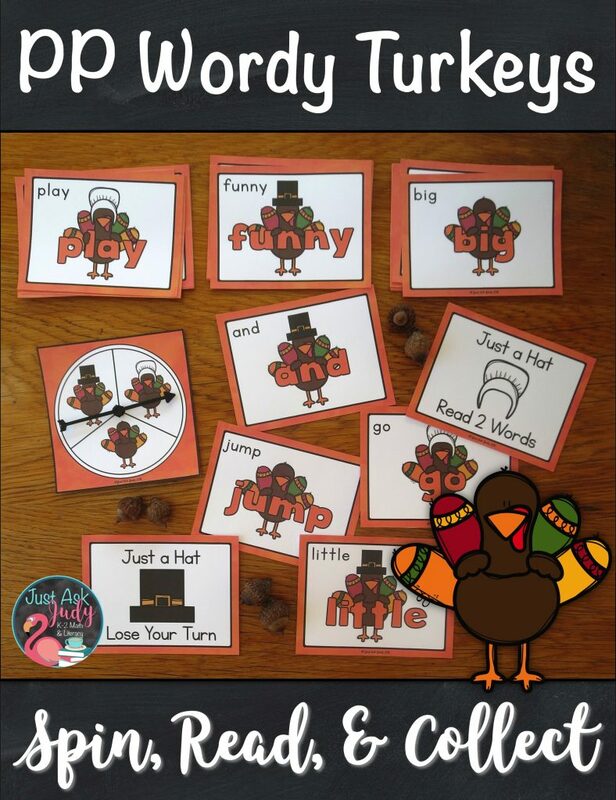 So here’s a free resource for you with 16 pre-primer high-frequency turkey word cards and a mat! This is not an original idea but those irresistible turkeys will be sure to reel your students in. You can find additional turkey word cards to use with this mat for purchase in my TpT store. Have your students practice reading and spelling these oh-so-important high-frequency words as part of your small group instruction or in an independent literacy center. Choose the color or black/ gray/ white option. There is also a black/ white mat. Print and laminate the word cards and mat(s). Use card stock for durability. You will need one mat for each student. Cut out the wordy turkey cards, trimming around the background. Store the cards in a baggie or seasonal container. Supply letters or play dough for building the words. Try letter tiles, letter beads, and magnetic, plastic, or wooden letters. Check beforehand to be sure your letters will fit in the middle space. Pick a word card. Place it in the top box on your mat. Trace the letters with your finger, the eraser end of a pencil, or a dry erase marker. Say each letter out loud while you trace it. Read the word. Build your word with letters or playdough in the middle space. Say each letter out loud. Then, read the word. In the bottom space, write the word with dry erase markers or crayons. Once again, say the letters out loud and read the word. This is a multi-sensory activity. The visual, auditory, kinesthetic, and tactile senses should all be actively engaged. Please don’t skip the tracing and naming or naming and reading out loud. Let there be purposeful noise! 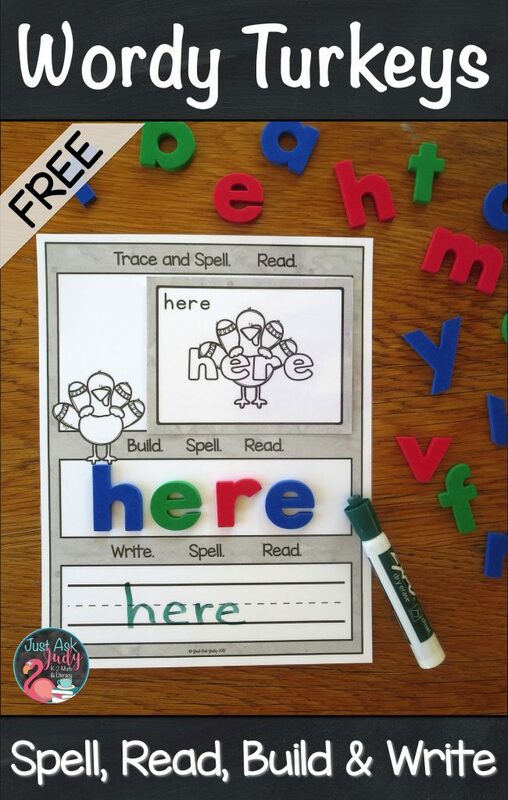 Click the highlighted words to download your free copy of Wordy Turkeys Spell, Read, Build, and Write. Looking for more high-frequency words to use with the mat? You can find the complete set of pre-primer wordy turkey cards as well as the sets of primer, first, and second-grade cards for sale in my TpT store. These cards are designed to play a game but work equally well for this spell, read, build, and write activity. Looking for more turkey activities? 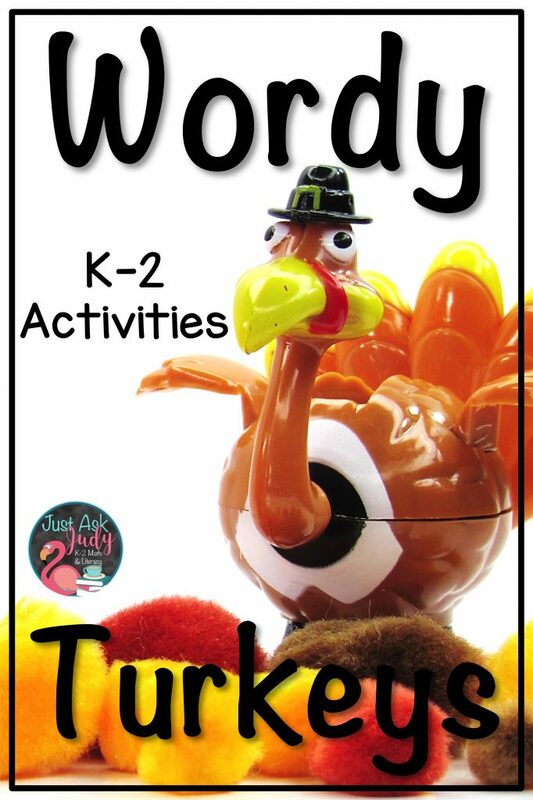 Check out these blog posts or the Thanksgiving category in my TpT store for more turkey-themed activities! The turkey photo in the title image is by Teacher Gameroom. Sign up to be the first to hear about my newest resources and freebies! Copyright © 2019 — Just Ask Judy • All rights reserved.